There's something uncomfortably ironic about the fact that "The Daily Show" host Jon Stewart, who pokes fun at political news for a living, has directed a film about a real-life journalist who becomes the victim of a very serious situation when he is captured and held captive in Iran for videotaping the riots sparked by the country's 2009 election considered rigged in the favor of totalitarian President Mahmoud Ahmadinejad. Even more interesting, part of the evidence used in the kidnapping was a satirical "Daily Show" interview in which featured the journalist identifying himself as a spy. 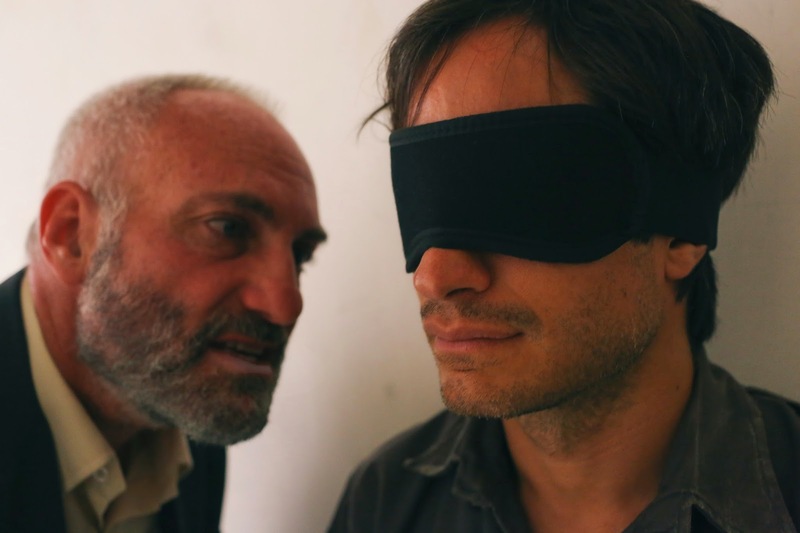 This is only the beginning of the awkwardness that sets the tone of Stewart's directorial debut, ROSEWATER. Based on 42-year-old Tehran-born journalist (living in London) Maziar Bahari's own bestselling memoir Then They Came for Me: a Family's Story of Love, Captivity and Survival, ROSEWATER attempts to duplicate Bahari's literary approach to his ordeal -- often infusing the story with humor as a way to cope with his predicament. But rather than a seamless dose of comic relief or a gradual descent into delirium, the film treats these moments as merely an obligation to the source material without being invested in why these moments even exist. They don't offer the substance they should because they just don't seem natural. Sure, watching Gael Garcia Bernal as Bahari locked up and tortured by a man Bahari refers to as Rosewater (Kim Bodnia) in solitary confinement could certainly use a few areas of levity, but at one point Stewart (who also wrote the film) makes it look like scenes that ended up on the cutting room floor of the "The Daily Show" -- funny, but meaningless. Which is a shame because the essence of Bahari's story is quite fascinating: the idea that a journalist with the proper press credentials is considered a threat simply because the government wants to control how their images are portrayed reinforces how the government often makes decisions based on fear. The fight for freedom of the press in a country whose citizens have very few rights (and the rights they do have are manipulated) could have made a powerful film. But Bahari is just one of many journalists around the world who are imprisoned for simply doing their job. So the question becomes why tell his story? What's the significance? Is it just because Bahari's story was exposed internationally (read: the U.S. got involved)? Stewart doesn't really seem to be sure. He says, "The original impetus for the film came from my own feelings of guilt and atonement over what happened to him in Iran." It was also a passion project for him because he believed Bahari's story deserves to be told. And it does. but there doesn't seem to be a particular angle here. The story simply seems to be for the sake of sharing it. Even though the performances are committed (Bernal is great and Shohreh Aghdashloo as Bahari's devastated mother is particularly heartbreaking in the film), the story overall has nothing really to say. It's very much on the level of "this is what happened and...the end." Stewart doesn't take his time constructing a message, even when he tacks on a flimsy ode to captive press at the end of the film. 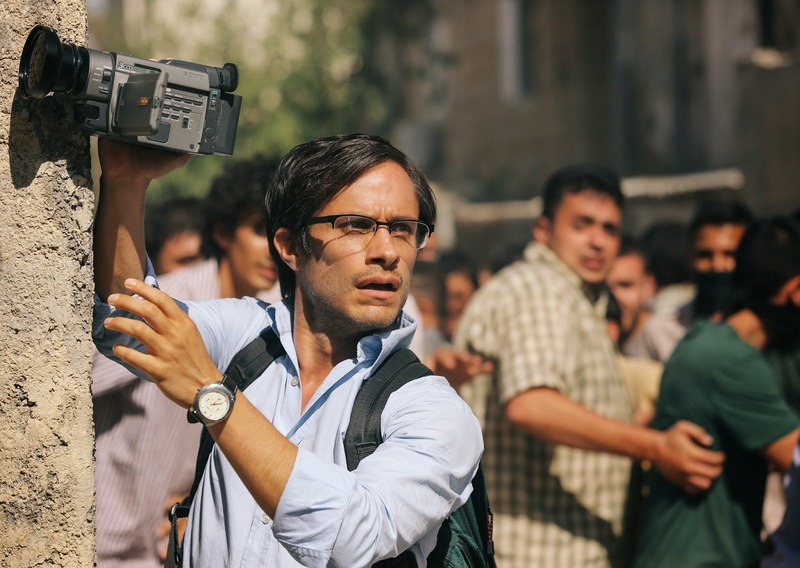 For a director known mostly for his unique approach to the political landscape, you'd think ROSEWATER would be a far more thought-provoking piece. But though his direction is wobbly at best, Stewart does succeed in telling Bahari's introspective story -- how the memories of his sister and father (both imprisoned years prior by their government for their political beliefs) got him through 118 days of captivity. We see Bahari essentially conjure images of his family members who offer guidance and encouragement. They're not the best executed scenes, but they effectively draw us closer to Bahari and his story. Which is something. The rest of the film is...kinda all over the place. Stewart sets up the film nicely when he places the audience directly onto the horrifying political scene in Iran, with Bahari catching it all on video, brings us to the bleak Evin Prison where the rest of the film takes place, then proceeds to oddly interrupt long bouts of exhaustive interrogation with dream sequences, an errant dance number and poorly structured (though legitimately funny) comic relief. By the third ac,t it all just becomes bewildering. ROSEWATER pretty much reveals itself to not have a point about midway through, at which time you're better off just coasting through the rest of the film -- marveling at how great Bernal and Aghdashloo are (and how unfortunate that the film isn't) and gracefully laughing on cue at the silly parts Stewart threw in just because. ROSEWATER opens in theaters Friday November 14th. Dang. I was going to give this a whirl, because I was curious about Stewart's take on Bahari's story. Oh well, I'll wait til Netflix. Good review! Wow. I'm actually looking forward to this one! It looked so promising.